The FMF Gold Series "Gnarly Torque" is computer designed and dynotested to focus power gain to each machine as needed. The Gold Series "Gnarly Torque offers power gains in low to mid-range with a little less on top than stock. The Gold Series "Fatty Torque" goes threw a stamping process to ensure that the pipe that you are purchasing from FMF has quality and performance with an optimum fit. 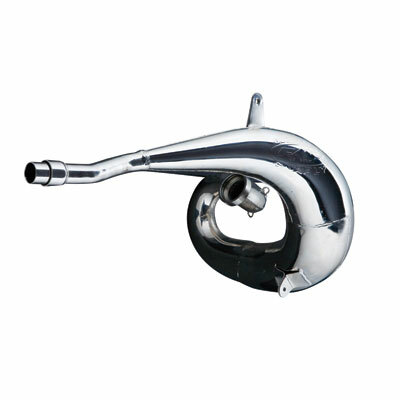 The Gold Series "Gnarly Torque" pipe helps to improve the throttle response, linear powerhand and enhanced over-rev. So if you are looking to add 4-stroke tractor like torque to your 2-stroke than this is the pipe you are looking for to withstand the harsh elements you will be riding in. Gold Series pipes are computer aided designed and dyno tested for top of the line performance. Constructed of 18 and 19 gauge steel with a durable nickel plate finish. Gold Series pipes for recent machines feature the exclusive "Fatty Design" for increased power.